Found footage! 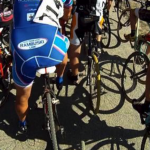 Digging around in the archives and found the footage for the 3rd gathering of the 2008 DFL Urban Outlaw Cyclocross-Dress Series. Filmed with my old HD Mini-DV cam stuck inside a customized tupperware container on the side of my helmet and balanced by a 2.5# weight on the other side. Those were the days. SGlad you finally used Lady Gaga.